You might see some other conversions of this template out there but I promise you’ll find ours to be top-notch and feature-rich. Check out our live Blogging Pro for Blogger demo to see and interact with the template before you even download it! This template was originally designed for WordPress by Design Disease and converted to WordPress by Blogging Pro. We loved this template but were disappointed we couldn’t find a good conversion for Blogger users so guess what? We converted it to Blogger ourselves! This section is actually setup to dynamically work except for the Feedburner link. You’ll first need to have a FeedBurner account. If you don’t already have one, please read the “How to Setup FeedBurner on Blogger” article and then come back. After you’ve changed this link save your template and check to see if it works. If you’re having trouble finding your feed name or id, please read our article above or see FeedBurner’s help section to locate it. This is a great location for showing ads and we really like how the designer laid everything out. The default ads are just a placeholder but of course feel free to use them until you find a replacement. You’ll need to again edit the template code to swap out the ads. Search your template for <div class=”Syndicate”> and right below that is where you’ll find the ad code block. Remember, when you paste in your own ads you will need to convert the ad code into a workable Blogger format otherwise you’ll get an error when trying to save it. Use our free AdSense Code Converter to change it automatically for you. You can also look at the existing ad code included in the template and use it as a model. This is a very important step and one that most people think is broken when they install the template. It’s not folks. You just need to go into your Blogger settings and make a small change before it will work. After you install the Blogging Pro template, go to your Blogger’s “Settings” => “Formatting” and look for “Timestamp Format”. Make sure you change it to this format: “Tuesday, January 25,2008? as shown below. This needs to be set in this format otherwise the date won’t show up properly on each of your posts! Actually the date will most likely be blank and you’ll think the template is broken. Remember to change the TIMESTAMP FORMAT (fourth item down on the page) and NOT the Date Header Format option. This is actually a really cool widget put into the sidebar by default. 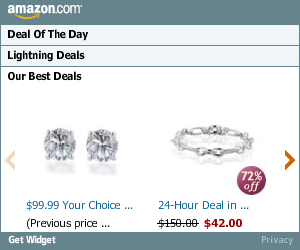 If you have never heard of Amazon’s “Deal of the Day” then you’ve been missing out! Basically each day Amazon has one special item they drastically reduce in price. Before you’d have to visit their site to see the deal but now it gets delivered directly to your Blogger site! If you want to replace or remove this widget you’ll need to edit the code and look for the following text “amazon-widget”. The line of code below that is the actual Amazon widget so just remove or replace it. I really love this part about the template. In the past, your footer was an overlooked piece of real estate on your blog. With this template, it makes good use of your footer like many of the other pro bloggers out there today. This one is easy to setup since we’ve already written an entire article dedicated to this. Please see “How to Setup Recent Comments and Posts Widgets” to configure these two widgets. These two widgets will both appear in the footer once you configure them properly. It’s a very good use of space and provides search engine spiders an entry point into your blog content. This is the other footer element which comes already setup with our recommended money maker links and programs. This idea came from the ProBlogger.net web site and we included it in our template. You are welcome to keep the links intact or feel free to replace them with your own. You will need to edit the template code to swap them out and also have affiliate accounts setup with each vendor. It’s easy if you don’t have any accounts. Just click on each footer link to setup a new account. Search your template code for “Recommended Money Makers” and you’ll see the links below that. This is a really cool feature within this template and the best part is you don’t need to do anything to setup it up! There are some further options if you click on “options >>” on your actual blog page under the widget but that’s it. 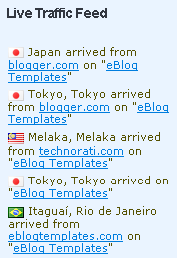 This is a sample of what it will look like once you start generating some traffic (or more traffic) to your blog. Thanks again to Design Disease and the Blogging Pro guys for making this wonderful template available for free. It was a great challenge converting it to Blogger but it was well worth the trouble. I can’t find the code to change the feedburner. at the top of this page it says to look for this code YOUR-FEED-NAME-HERE but it is not there. oops, found the feed one, when i posted the <strong part it just made text bold so i just searched for the bold text without the <strong..
i found this adsense code but not sure which part to change? or if there is another way. found amazon code but couldnt understand that too. i wish there was a delete comments option, anyway i figured out how to do the adsense, and decided i will delete the amazon one, so problems solved. ya….. joe joe….. the adsense code is irritating for our blog…. who’s publisher id is this… we want to put our own adsense publisher id only…. mr.author…… please tell about the adsence code..
jojone please change the adsence code.. I have modified this template, with easy widget for Recent Comment and Posts, and ihave included a comment box. Find it on Colorizetemplates(dot)com, with Blue or Orange Category. I cannot find the place to put the Feed .I have read over the html a dozen times .cannot find anything that says:your feed name here . Also, where is that technorati link, can you get that changed ??? don’t worry about that google ad host..
hi again, i have decided not to use this template now. 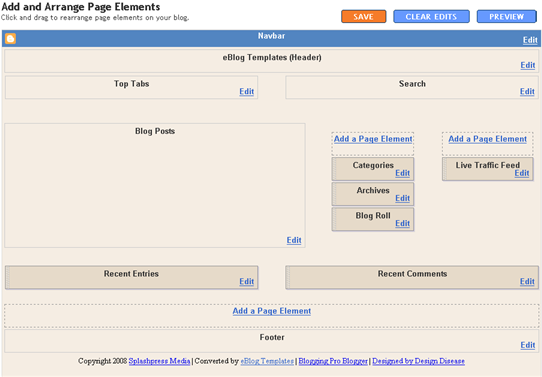 the problem is that blogger wont let me use adsense now on the new template (from blogger). is there some code i need to change? if not do you know how i can reset the blog without loosing posts? I cant upload to new blogger setting. seems like blogger has changed their setting…. Or maybe someone can assist me how to setting this template? Hi, i try this fantastic template but there is one thing that make me mad and sad. I have a problem to display the word “Post a comment” at the end of the comment list. Here (http://i34.tinypic.com/28kiooz.jpg) you can see the problem, that you can see also on your live demo of the template. This problem with ad-blocks is only in the single pages, because in the home page everything is shown correctly. I hope you can help me because I’m so worring about this, if the visitors can’t display the word “Post a comment” how they can comment my posts?? I’ve been using this template for more than a couple of years. very nice…. thanks for this template!! Wonderful theme, but i can download it. Hi, I try this fantastic template but there is one thing that make me mad and sad. I have a problem to display the word â��Post a commentâ�� at the end of the comment list. Here (http://i34.tinypic.com/28kiooz.jpg) you can see the problem, that you can see also on your live demo of the template. I hope you can help me because Iâ��m so worring about this, if the visitors canâ��t display the word â��Post a commentâ�� how they can comment my posts?? why I can’t display the date (in the beginer post title) when i posted my article? is this theme optimized for adsense? can I download free this template blog ? This blogger template remind me first time i touch blogspot, i think its very cool if this template has a responsive feature for nowaday.